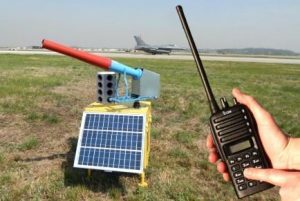 The Reed-Joseph International Company’s digitally controlled Scare Wars® System is designed to assist you to effectively combat the bird and wildlife threats at your airfield. Reed-Joseph and its staff are recognized as bird and wildlife control experts. We have been providing solutions to the aviation community for over 60 years. Reed-Joseph International Company has experience working with all types of airports and all types of organizations, including government agencies at all levels. We are the experts in our field. When installed and properly combined with the appropriate environmental activities, along with the proper mix of harassment techniques, including pyrotechnics, the Reed-Joseph Scare Wars® System will produce effective deterrent results for your aircraft operations. In addition to being there for you 24/7, Scare Wars® reduces manpower requirements and potential runway incursions, operating at optimum efficiency. Introducing the New Scare-Away R4 Cannon! We are especially proud to introduce our new Scare-Away R4 Cannon which is completely electric with fewer moving parts. 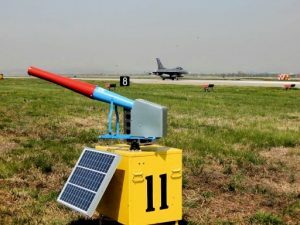 It is the latest addition to our Scare Wars® System which is designed to operate at maximum readiness and successfully reduce bird and wildlife threats at airfields just like yours. 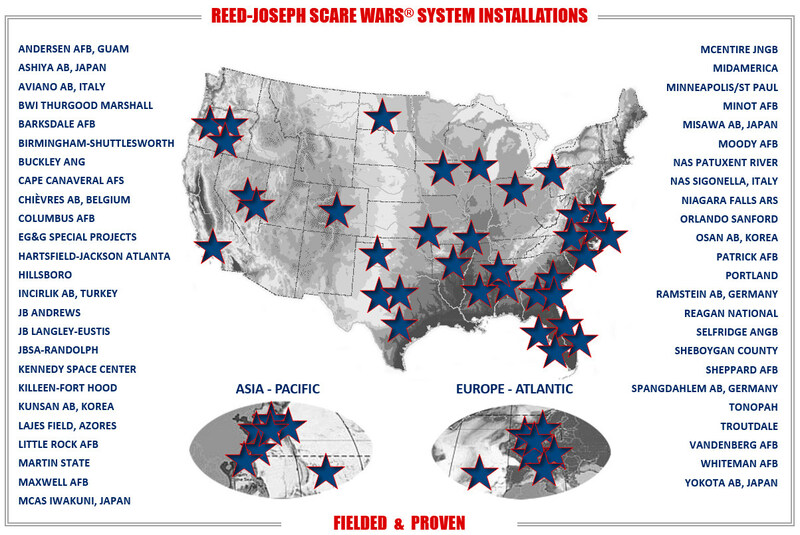 Each airfield is unique in both its risk and management challenges, but it has been proven that the Reed-Joseph Scare Wars® System provides a solid foundation to build and implement a successful bird aircraft strike hazard (BASH) program. The Scare Wars® System provides the most cost-effective return on investment for any bird and wildlife control product on the market. All Scare Wars® Systems are turnkey and installed by our professional crews. Below is a list of the components that come with our system. Portable, secure and solar powered. Weather proof and self-contained, 16 gauge galvanized steel. All New Electronic Design providing greater effectiveness. Field tested sounds employed by wildlife control specialists worldwide. Completely electronic with fewer moving parts. Provides multiple shots, with irregular intervals in between. 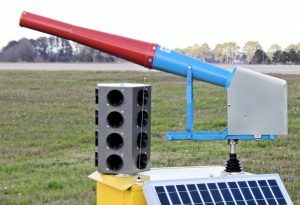 ‘SmartCannon’ design turns the cannon off even if radio command is missed. Electronic design allows better cannon performance and less maintenance. Bird Gard® broadcasts crystal-clear, actual bird distress, predator and synthesized sounds, digitally recorded using advanced microchip technology. Features programmable, multiple sounds customized to suit the specific airfield environment. Two high-output amplifiers create 125 decibels of crystal clear sounds, with frequency range of 2,000 to 5,000 hertz, specially designed for maximum effect on birds’ auditory senses. 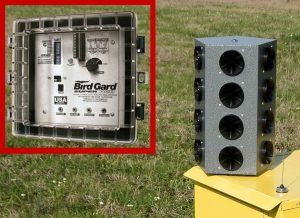 Bird Gard® is simplicity at its finest; solid state with no moving parts. The Master Workstation transmits commands to the Remote Bird Deterrent Units on the airfield. Operates with Narrow band channel spacing. High speed, digital data transmission. Fuel gauge estimates remaining LP gas in each Remote Bird Deterrent Unit. Triple redundancy, assuring more reliable radio transmission. Customized airfield diagram showing each unit’s location on the airfield. 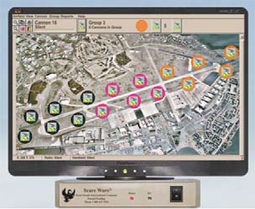 Allows the Scare Wars® System to be activated from anywhere on the airfield. It’s synthesized programmable; power output is selectable with narrow band channel spacing. Can control individual units, groups, or all units without restriction. We have integrated the best available technologies in both hardware and software to give you the most efficient bird and wildlife control system available on the market today. Let us help with your bird and wildlife problems. Let our Scare Wars® System protect your assets.